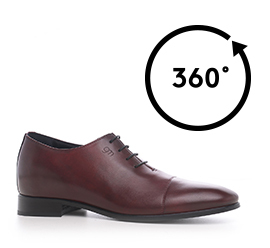 Stylish "wholecut" elevator shoe in burgundy calfskin and real leather sole. A shoe obtained through a complex handcrafting in which a single piece of leather is used to create the upper. The hand brushing process gives unique and harmonious colour reflections. A dress shoe able to increase height by 2.4 inches, with a clean and refined design, ideal to match any outfit.